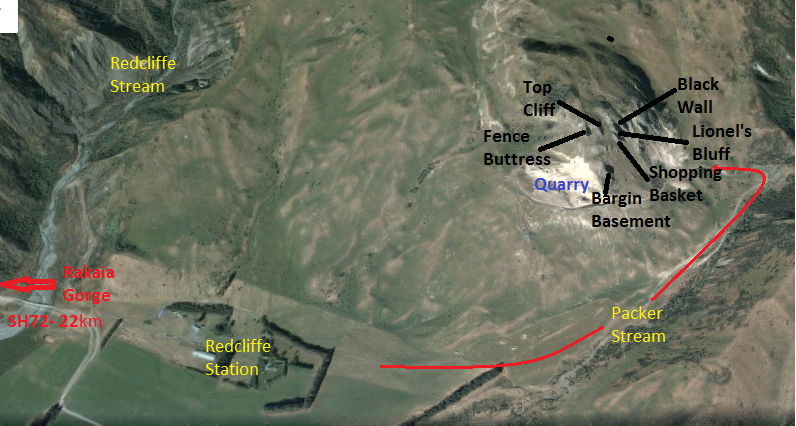 A group of small limestone cliffs on the south bank of the Rakaia River. Go to the intersection of State Highway 72 and Blackford Rd, (Mt Hutt Station south of Rakaia Gorge), turn up Blackford Rd and follow this to the bridge that crosses Redcliffe Stream, and onto Redcliffe Station. Please phone for permission for all recreational visits. The best number for access is Duncan Ensor 03 318 5054 or 021 855 014. Good early season ski touring opportunities at the head of Cascade Glen and beyond. Excellent new 4wd track runs in to Redcliffe Saddle. Best number for access is Duncan Ensor 03 318 5054 or 021 855 014. Yes but the farm name is Redcliffs and the sign on the bridge is spelt that way also. So do we use the local spelling or the "official" spelling? Canterbury Rock also spells it incorrectly, as Redcliffs.